For distance runners, tempo runs are usually fun. This is your chance to push yourself in the middle of a run. Today was not a fun day! 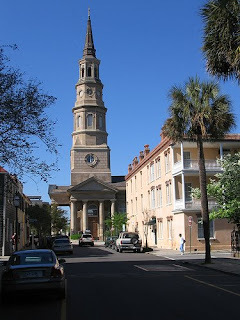 I started off with a warm up mile and did my usual route through Downtown Charleston. There were only about six runners that met at MUSC to start the run. The temperature is already getting hot at 6:00am and it was pretty humid today. I ran the first mile with the group (10:31 pace) and had some company for the other four miles. Andrew, who is eleven years younger than me (just wanted to throw that in), wanted to run a fast pace for his middle miles and decided to join me. I am doing a mini taper for the the 5k race this weekend so I was only trying to hit a 7:57 pace. Our second mile was 7:52 and our third mile was 7:58. On the forth mile I felt like I could not get enough air and slowed to 8:30. Not sure what was wrong, but I just was not breathing well and felt weak. I didn't sleep well last night and that could be it. We finished the last mile with a cool down 9:44 pace.